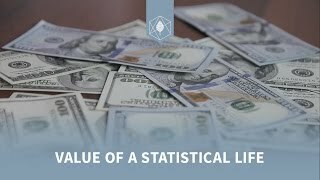 When policies are designed to reduce health risks, agencies use a metric called the Value of a Statistical Life, or VSL to estimate benefits. In the simplest terms, a VSL is an estimate for how much people are willing to pay to reduce their risk of death. Alternatively, the VSL can be thought of as how much people are willing to pay for safety. Ideally, using accurate estimates of the VSL would enable agencies to conduct cost-benefit analyses that correctly identify efficient policies designed to protect people from risk and improve health. There are several reasons, however, to be skeptical of policies proposed by government agencies in this area. Individuals have cognitive biases that do not allow them to accurately assess the risks they face. People often overestimate small risks and underestimate relatively large risks, which can inflate VSL calculations for small environmental hazards. Policymakers, voters, and politicians are also subject to these biases which leads to over-reaction to and over-regulation of small risks. Publication bias occurs when journals are more likely to publish studies that find large or statistically significant VSL estimates, while studies with small VSL estimates are less likely to be published. Some studies suggest VSL estimates may be significantly overestimated due to publication bias. Accounting for this bias may reduce VSL estimates by as much as 70 to 80 percent. Stated preference studies ask people how much they would be willing to pay to reduce risk in a hypothetical situation. Stated preference studies are subject to “hypothetical bias” that can inflate VSL estimates because people say they are willing to pay more to avoid risk than they actually are. Stated preference studies regularly fail scope tests. Preferences estimated from these studies do not appear rational. In other words, willingness to pay estimates from these studies are not related to the size of the risk. Public Choice Theory suggests that government agencies are incentivized to use policies and procedures designed to maximize budgets. Agencies are incentivized to use larger VSL estimates to increase the likelihood that their proposed regulations will pass a benefit-cost test. Agencies have the incentive to ignore or avoid doing benefit-cost analysis on regulations that would not pass. VSL estimates are subject to political pressure. It is politically unpopular to reduce the VSL because the public perceives reducing the VSL as lowering the value of life. When the Environmental Protection Agency tried to reduce VSL estimates for senior citizens to reflect older people’s lower willingness to pay for risk reduction, Congress prevented this change from happening to avoid upsetting constituents. Ignoring or avoiding benefit-cost analysis can lead to over-regulation. Over-regulation has real implications for American taxpayers and consumers. When government agencies over-regulate, this limits people’s ability to make decisions for themselves, reduces economic efficiency, and raises compliance costs.